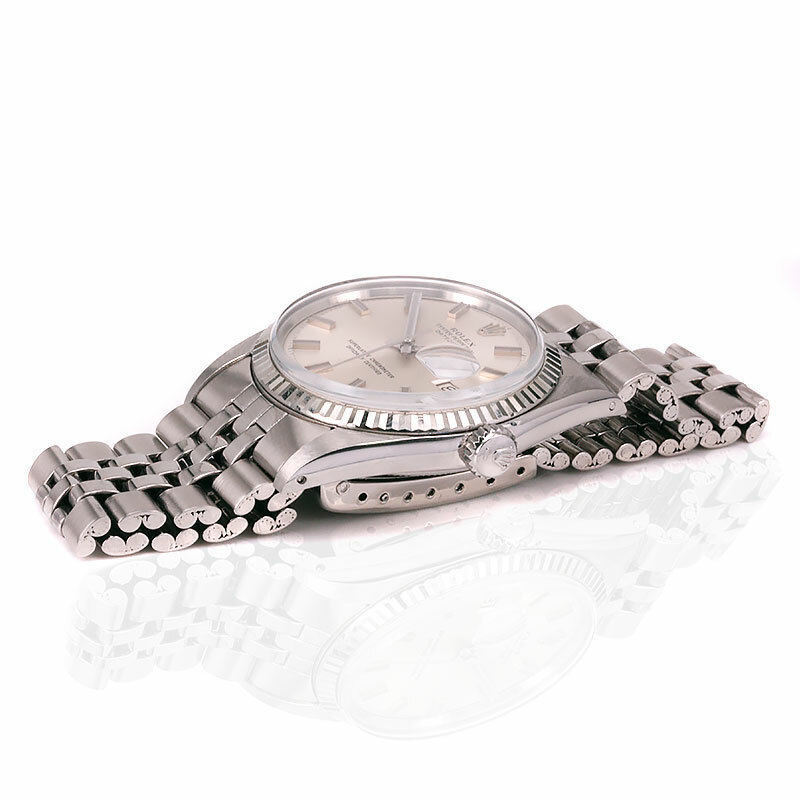 Product code: W1515cc Categories: Rolex Watches, Watches. The price of many vintage Rolex watches with even the same reference number, can vary so much and be more or less desirable depending on one thing – the dial. And here we have a very rare dial indeed – a completely original vintage 1972 Rolex 1601 with the “Wide Boy” sigma dial. First a bit about the sigma dial. Looking at the bottom of this dial, you will note that on each side of the T Swiss T, there is the Greek letter, sigma which can be seen here – Ó. What this subtle yet important mark designates, is that the hands and index markers are in solid gold. Used by approximately seven watch companies in Switzerland from 1970, it was among its main reason to signify when gold parts were on the dial to subsequently add to both the financial and intrinsic value of a watch. And then to continue with the dial, this is what is referred to as having “Wide Boy” markers and hands. As can also be seen in the images of the dial, both the index markers and hands are much wider than standard giving this Rolex such a great unique look to it. Both of these features give this vintage Rolex such an amazing talking point and difference to a standard 1601. 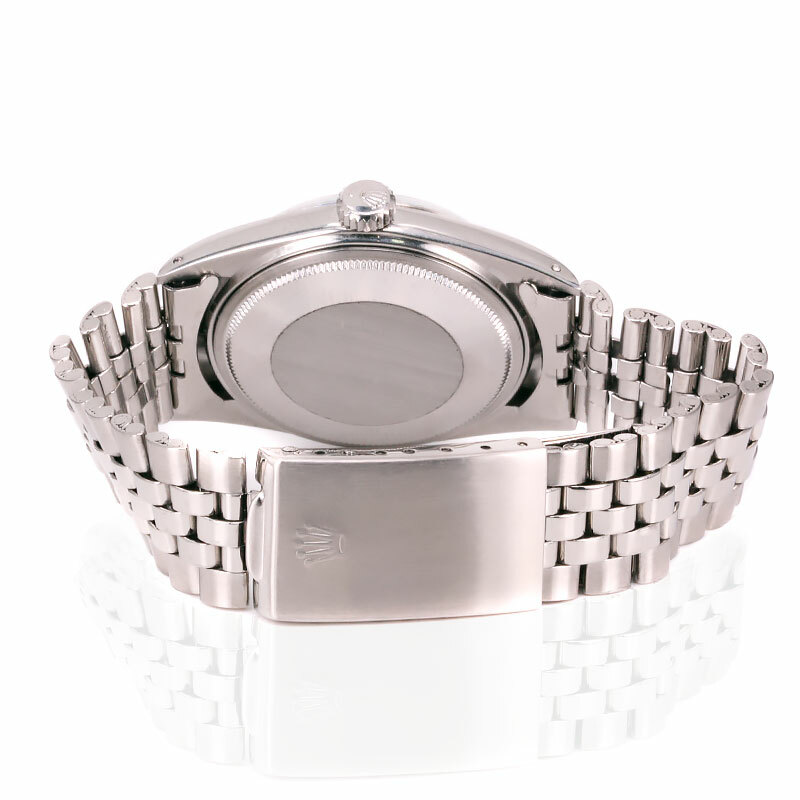 Fitted with the 18 carat white gold bezel, the stainless steel case measures the iconic 36mm across plus the Rolex screw down crown and is fitted on a Rolex Jubilee band. Inside is the 26 jewelled automatic Rolex calibre 1570 that has been serviced, runs great and comes with our twelve month warranty. From near or far, this is such a handsome and special example of a vintage Rolex 1601 that will always get the attention that it rightly deserves. Tags: Roelx Sigma dial, Rolex, Rolex 1601. Vintage 1972 Rolex 1601 with the “Wide Boy” sigma dial. The Rolex Oyster Perpetual Datejust model 1601 has become such a highly sought after Rolex model in recent years. The history behind sigma dials is a very interesting one which has now made watches with these dials highly sought after. The sigma dial is discreetly marked with the Greek letter sigma (Ó) on each end of the T SWISS T or SWISS at the bottom of the dial. From 1970, watch companies who were members of the l’Association pour la Promotion Industrielle de l’Or (APRIOR), such as Rolex, Patek Philippe, IWC, Omega and Vacheron & Constantin to name a few, produced dials with the sigma letter to notify that the hands and index markers are made in gold. This was used at a time when the Japanese “quartz revolution” started coming in, and sigma dials were produced for one main reason – to notify when gold parts were used on a watch, including the dial to subsequently add to both the financial and intrinsic value of a watch. An important and quite interesting point to note, is that the sigma dials can be found on watches that are made all in stainless steel ie case, band and bezel, but with a sigma dial, not the index markers and hands.